Item number 3129/1 a-c from the MOA: University of British Columbia. 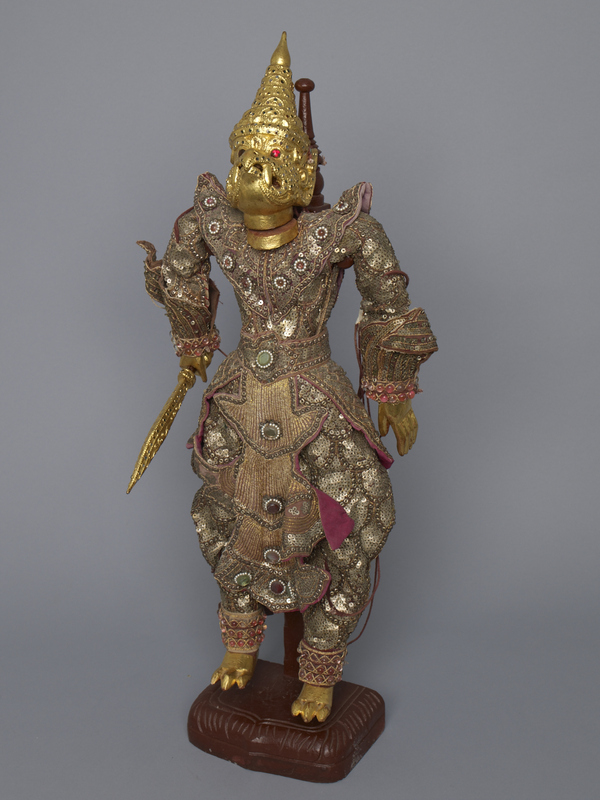 Puppet of Garuda. 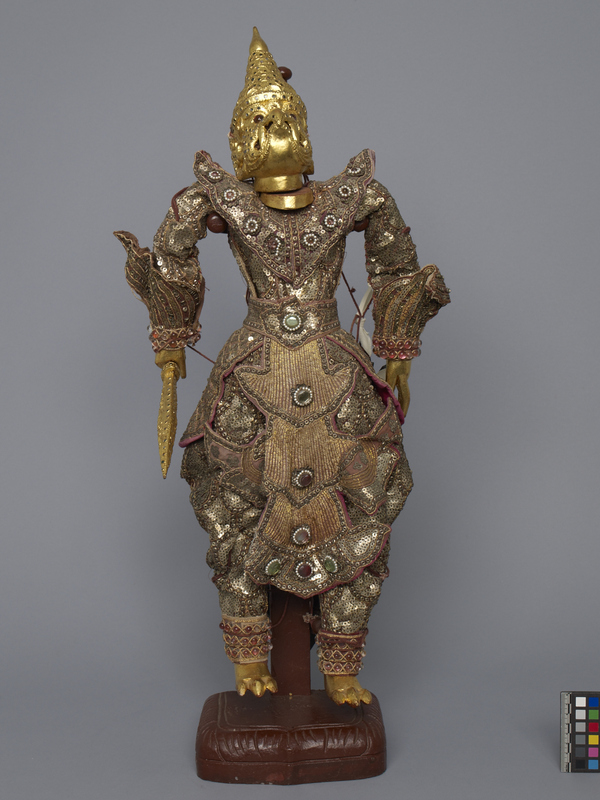 The figure is made of wood overlaid with an elaborate suit of clothing that is fully covered in pewter-coloured sequins, gold metallic thread and beading. Shoulders and elbows of the outfit are padded and pointed, with a heavy coat tail, and long front flap decorated with coloured, jewel-like buttons. The figure's feet and hands are painted thickly in gold, as is the moveable head. The face shows a curved beak with long canine teeth emerging, large pointed ears, and a tall conical hat painted gold. Small shiny stones are embedded in an even pattern across the head and hat. Part b is a gold dagger also covered in gold with inset stones. The weapon fits inside the figure's closed right fist. Thick string is attached to the figure at wrists, upper arms, knees, ankles and head, leading back to a wooden controller. 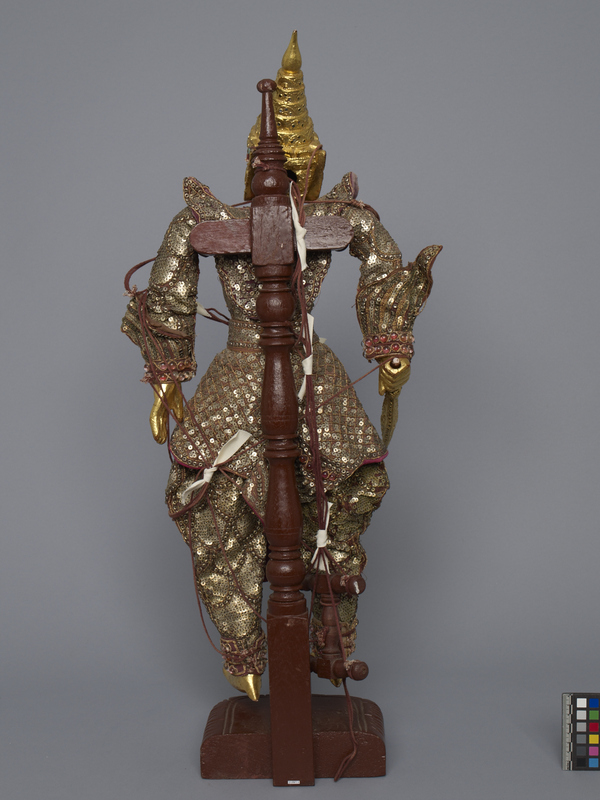 Part c is a wooden stand painted burgundy, with a thick base and decorative post with two horizontal pins that hold the figure under the arms to display it in a standing position. Garuda is a large mythical bird or bird-like creature from both Hindu and Buddhist mythology. Garuda is usually shown in either zoomorphic form (a giant bird with partially open wings), or anthropomorphic form (a man with wings and some bird features).